Decatur Emerging Leaders (DEL), a program of the Greater Decatur Chamber of Commerce, is a group of young professionals from different backgrounds and industries in the greater Decatur area who provide unique opportunities to network with our peers, as well as chances to volunteer and develop professionally. By building connections with peers, local businesses and institutions, these leaders secure the community's future and ensure it remains vibrant and inclusive. The mission of DEL is to strive to create inspired, influential, connected leaders in Decatur and Macon County. Its vision is to lead the way toward an energetic and dynamic future for Decatur. Members are typically between the ages of 21 and 45 years of age. 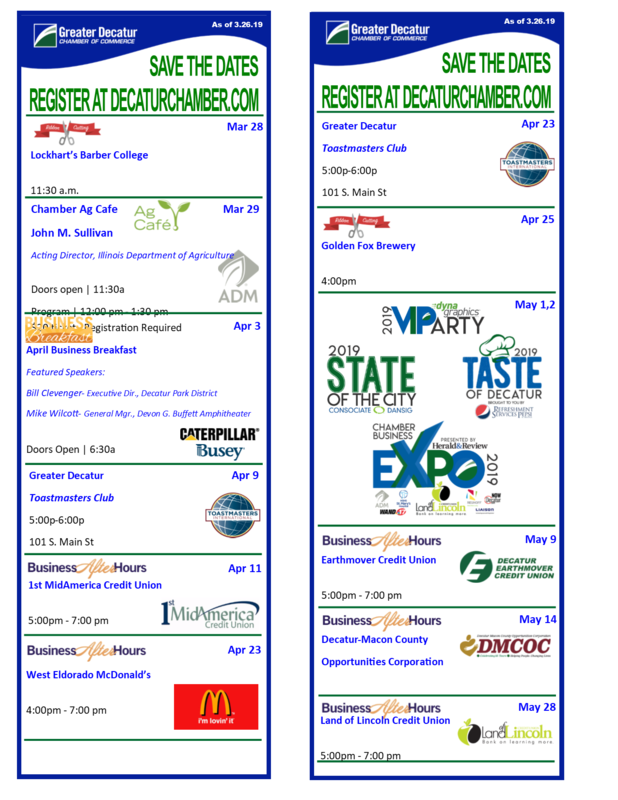 Watch for upcoming event announcements under Chamber Events. • Sip and Socialize - a chance to eat, drink, and mingle with other Decatur YP's in a casual atmosphere. • Table for Ten - Have lunch with 10 other young professionals at local restaurants. • Rise Up - a chance to develop professionally and help you advance in your career. • My Story - Hear from community leaders. Learn how they developed in business and how you can do the same. • DEL Cares - a great opportunity to volunteer and make a difference in our community.